BODY CONSTRUCTION: All-welded construction, 16 gauge diamond perforated sides, 18 gauge back, 16 gauge top and 16 gauge reinforced bottom. DOORS: 14 gauge diamond perforated doors with 18 gauge full-height door stiffener for both doors is standard. All Welded Military Gear Storage Lockers Are Designed To Store Military Gear Using Secure, Durable And Guaranteed Construction That Lasts A Lifetime. 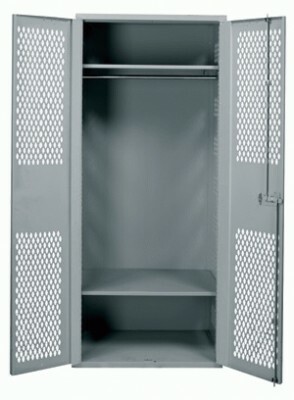 Military lockers are made using all welded steel with 16 gauge diamond perforated sides, 18 gauge back and 16 gauge top and reinforced base. 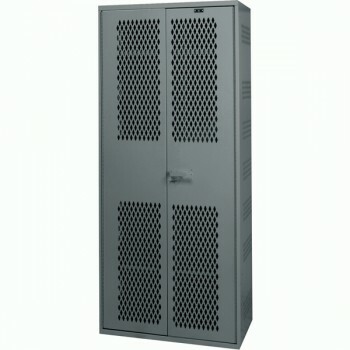 Locker doors are 14 gauge diamond perforated steel with 18 gauge full-height stiffeners for extra strength. Perforated panels allow ventilation of contents. Doors include high security 3-point cremone latching handles and 16 gauge continuous piano hinges for extra security. Includes 16 gauge fixed height steel shelves and a full width coat rod with 2 rear coat hooks for storage. Gray powder coat finish. Lifetime Limited Warranty. Model No: Size: Color: Price Ea. For bulk pricing please contact one of our friendly sales staff for a quote!